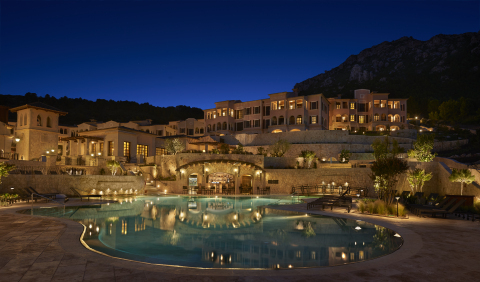 CHICAGO--(BUSINESS WIRE)-- Hyatt Hotels Corporation (NYSE:H) today announced the opening of Park Hyatt Mallorca in Spain, the first Park Hyatt resort in Europe. Located on the undiscovered Northeast Coast, the hotel will also mark the first Hyatt hotel in Mallorca. Guests are able to enjoy world-class dining options centered around a Mallorquín village square, Plaza de la Torre. The authentic cuisine offered at Park Hyatt Mallorca includes locally inspired dishes at the Balearic Restaurant. Additionally, the resort features an Asian restaurant located in a private villa with views over the Canyamel Valley, an all-day Bistro, Café sa Placa, and a stunning tapas bar. Luxury facilities at Park Hyatt Mallorca include a landscaped poolside terrace featuring three swimming pools, two of which are heated, and a separate children’s splash pool. The resort’s Serenitas Spa offers seven treatment rooms, including two couples’ treatment rooms, each with their own terrace. There is a selection of signature treatments using locally inspired therapies and the spa is complete with a Himalayan salt sauna, steam rooms, and an outdoor Jacuzzi. Guests can also enjoy access to the superb facilities at Cap Vermell, including a beach club just a 10-minute walk away. The estate’s country club, scheduled for completion in July 2016, boasts paddle ball courts, two tennis courts, an indoor heated swimming pool and outdoor pool. Within 15 minutes of the hotel, guests will have a choice of four superb golf courses, including a full 18-hole course adjacent to the resort. Park Hyatt Mallorca is home to the Residence, housing a selection of elegant meeting rooms and a purpose built show kitchen that opens onto a beautiful Mallorquín courtyard. The Residence is styled with fine furniture and artistic flair to create a visually impressive, yet functional meeting space. A stunning 2,400 square foot ballroom offers an extensive terrace and access to a landscaped garden with a gazebo overlooking the valley. For more information or to make a reservation at Park Hyatt Mallorca, please visit the hotel’s website.